It only takes a little bit to start giving back to your community. An extra three dollars, to be exact. That’s the cost of using one block of renewable energy—affordable and sustainable, energy from wind, solar and biogas resources. Of course, renewable energy isn’t just good for the planet. It can also help control our community’s energy costs over the long term. Many opinion surveys show that consumers are more likely to buy products and services from companies who care about the environment. So make an investment in renewable energy. Your customers will appreciate it now . . . and for years to come. It’s Clean. The more renewable energy we use, the less coal, oil and natural gas we’ll burn which can have a dramatic effect on the air we breathe. In fact, according to the US Environmental Protection Agency, using just one $3 block of renewable energy each month for a year is as good for the air as not driving your car for five months. It’s Sustainable. Wind, biogas and solar will never run out—something that’s simply not true of conventional resources. And because it is produced in the Midwest, renewable energy can increase our energy independence. It’s Smart. Renewable energy isn’t just good for your organization’s image. In time, the increased use of renewable resources should buffer the US economy from big swings in the cost of coal, oil and gas. Plus, the money you spend on renewable energy gets spent on new, environmentally-friendly alternatives that will help control energy costs in the future. Our Green Power for Business Program is Green-e Energy certified. 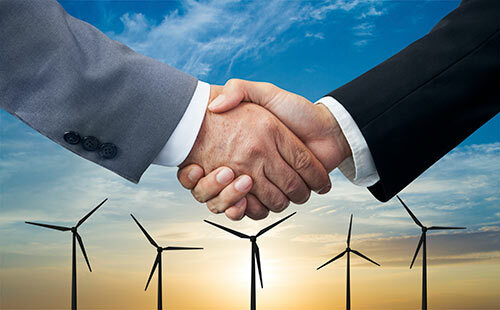 Green-e Energy was established by the non-profit Center for Resource Solutions to provide information and an objective standard for consumers to compare renewable energy options, and to verify that consumers get what they pay for.